WWE.comArguably, among Paul Heyman's greatest achievements was transforming two marginal wrestlers into one of the most highly sought-after tag teams in the United States. 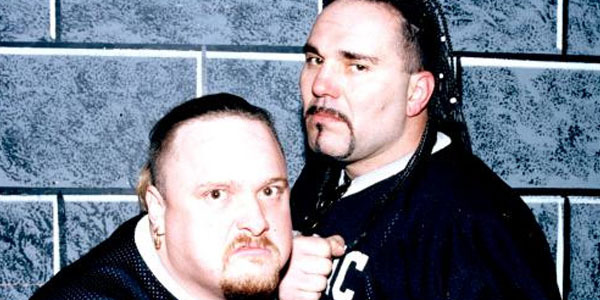 ECW creation The Public Enemy (Rocco Rock and Johnny Grunge) was born in 1993 and after years of bloody battles, often involving tables, the duo landed contracts in WCW. From 1996 to 1998, each member of the team earned than $160,000. While they did have an abbreviated tag reign (beating Harlem Heat in September 1996), the table-totting brawlers were an odd fit for World Championship Wrestling. Their follow-up deal with WWF in 1999 only lasted a few shows. The pair quickly got themselves in the doghouse in Vince McMahon's company. They sole feud was against the APA. Bradshaw seemed to especially take pride in hitting PE with all he had. The pair didn't last long in WWF. JBL has elaborated on the story on his blog claiming Public Enemy got themselves a lot of heat by showing up late and trying to change the finish. Allegedly, Kurt Angle saw the match and the brutality of the encounter almost made him reconsider becoming a professional wrestler. In the end, Public Enemy's tenure in WWF was incredible abbreviated - being seen backstage after an alleged "kidnapping" did them no favors - and they returned to WCW (Junkyard Invitational) and ECW before both of those companies collapsed.